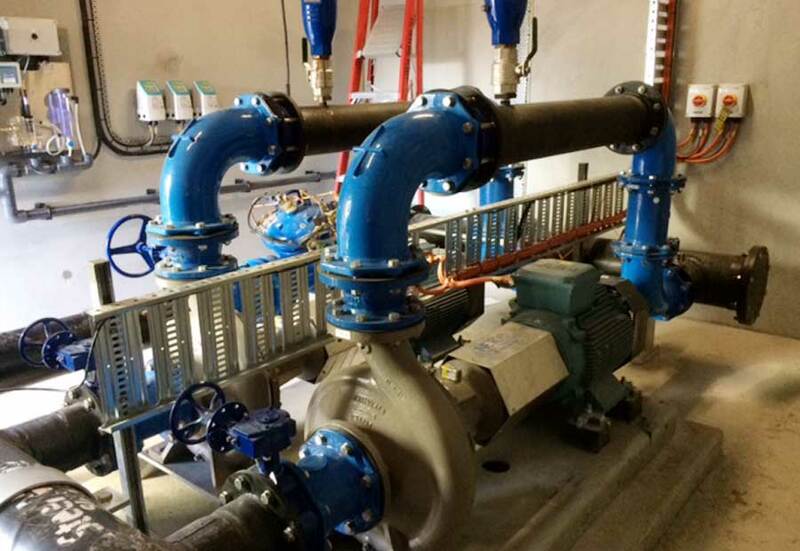 Shaw has considerable expertise in the construction of water and sewer infrastructure having constructed numerous pump stations, pipelines and water treatment plants. 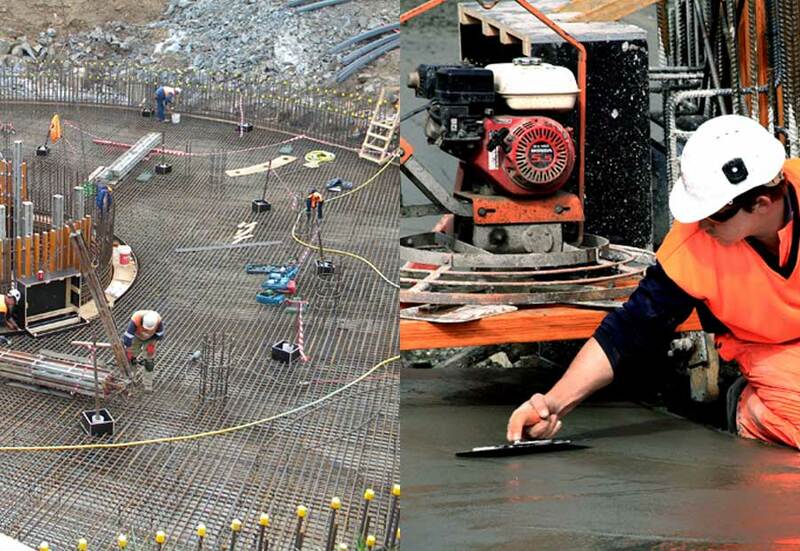 Shaw can provide design, construction and commissioning for all water and sewer infrastructure. Ringarooma, Legerwood, Branxholm and Derby have operated independently and historically had variable water quality, currently with all four towns on permanent boil water alerts issued by the Department of Health and Human Services (DHHS). 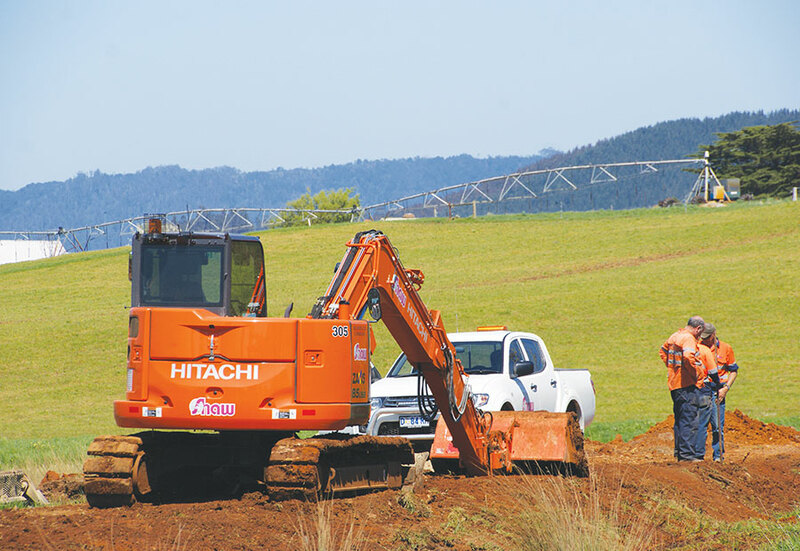 Shaw Contracting was engaged by TasWater to install over 30km of water main, as well as a booster pump station to connect and service the four townships with a safe, healthy and reliable water supply, in line with national drinking water standards. 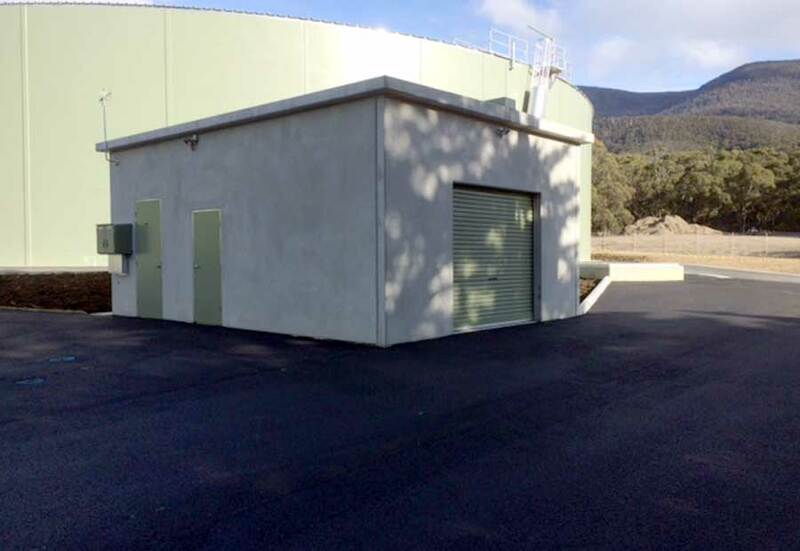 This project was completed in time for the new Tasmanian Diary Products powdered milk factory to dispose of waste materials into the sewer system. 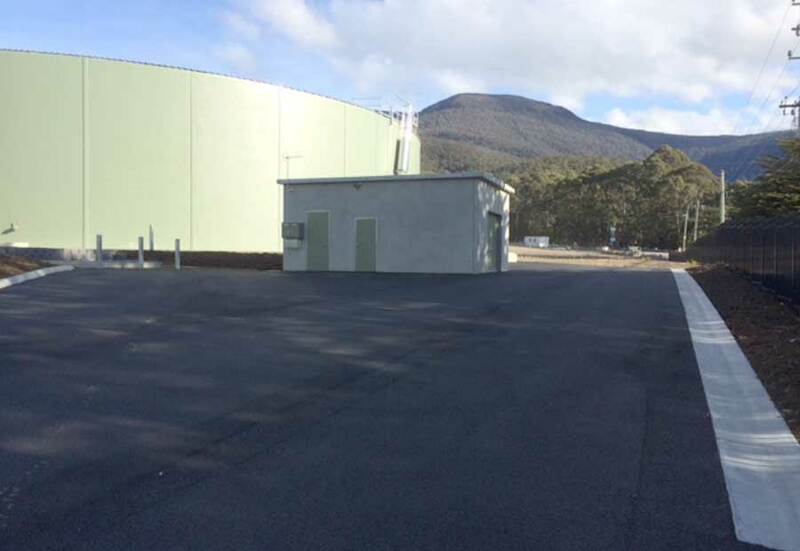 This was a critical outcome of the project from Cradle Mountain Water’s perspective as significant penalties were associated with the Trade Waste Agreement not being achieved. 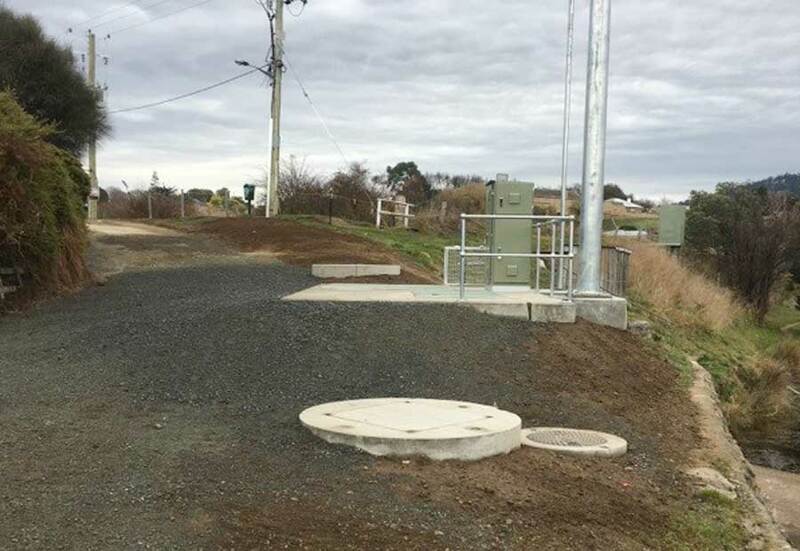 The project was efficaciously delivered to all stakeholders as part of TasWater’s goal to remedy the permanent boil water alerts in the north-east of Tasmania. Employing the diverse skill set of Shaw Contracting’s personnel, the project was delivered to the highest standard both on budget and to schedule. 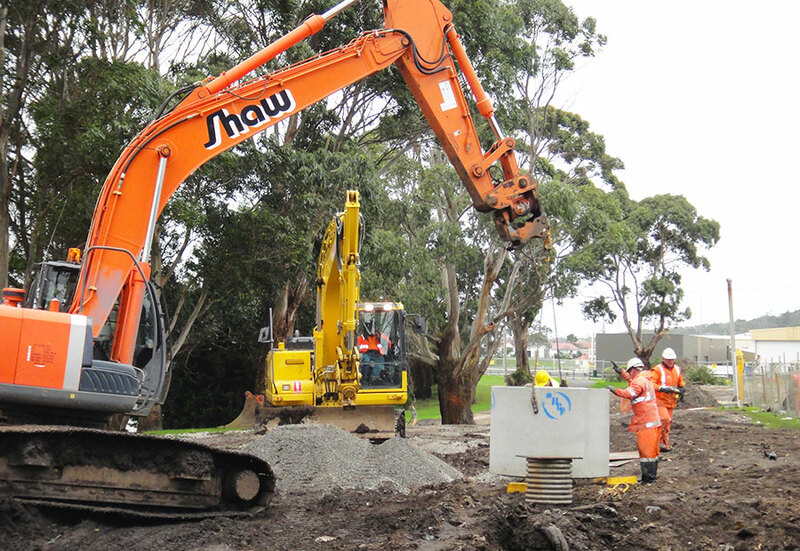 Shaw Contracting was awarded the $2.7 million dollar contract from Cradle Mountain Water to upgrade the existing M3 Sewer Main in Smithton. 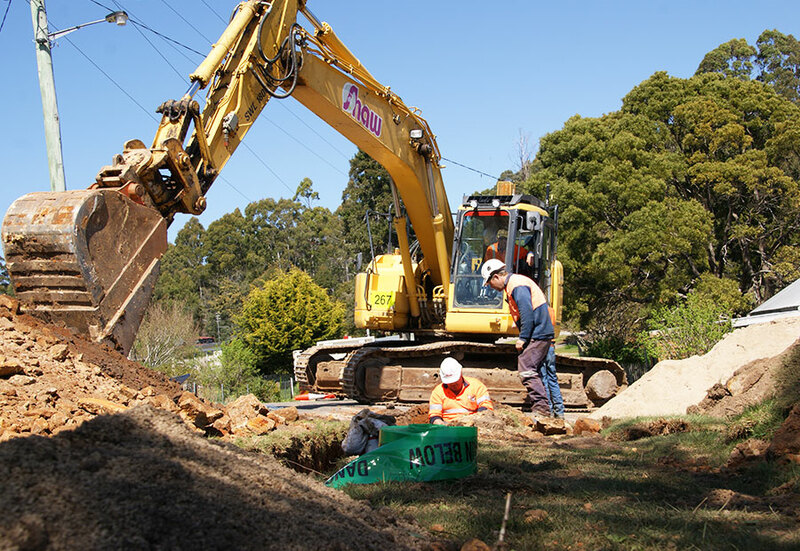 The project involved the installation of 1.8km of new gravity sewer main up to 525mm in Dia at depths of up to 4.8 metres. The project timeframe for this contract was extremely tight with only a 4 day tender period, commencement within 3 weeks and construction period of 10 weeks. Shaw Contracting identified early target pipe installation quantities and decided to employee a two team process working on either end of the project. Target pipe installation quantities were achieved and the final connection was completed some 7 days early. 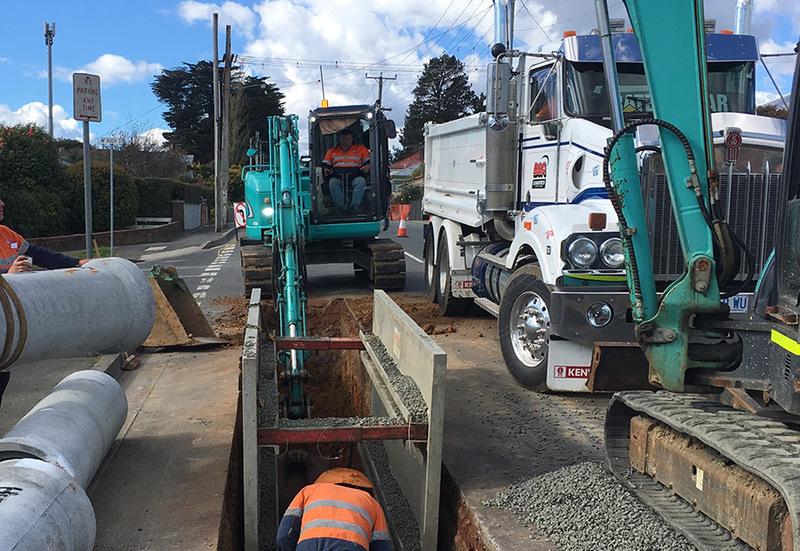 Other challenges included the significant depth of the pipe to be installed including up to 4.8m deep in residential streets and also up to 4.0m deep on Nelson Street, a main arterial road into Smithton. 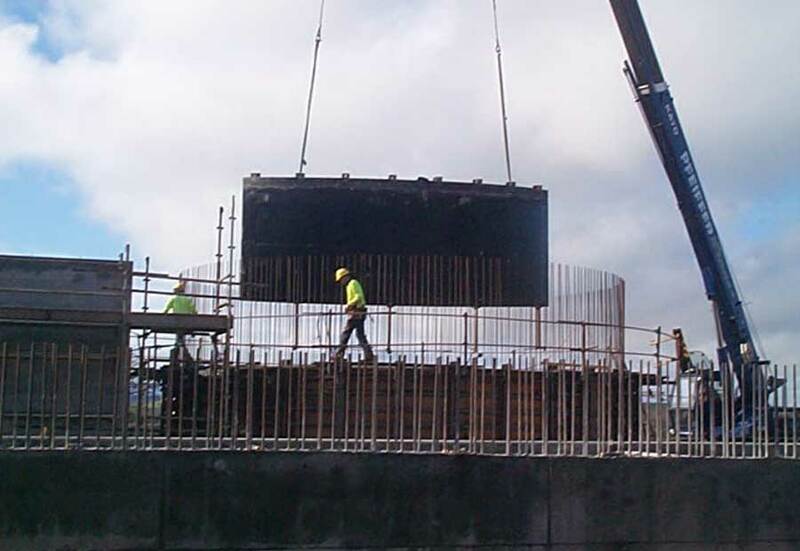 This process was developed early in consultation with CMW to undertake all works using shoring boxes, and single lane closures on the roads to minimise risk and disruption to workers, pedestrians and motorists throughout the project. During construction another challenge was identified, being that the new pipeline went straight through the redundant Smithton Refuse Disposal site located along the Duck River. 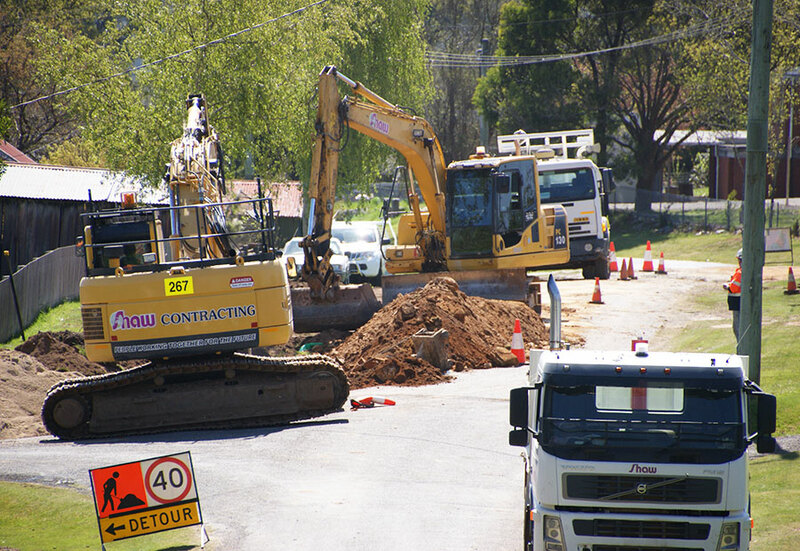 This issue caused some minor delays but with the assistance of environmental consultants and working closely with the EPA all issues were resolved in a timely manner and allowed works to proceed. “CMW would like to express their appreciation to the project team of Shaw Contracting for delivering the project on time and on budget." The construction of a new underground sewerage pumping station and associated pipe works including new electrical switchboard. Demolition of the existing waste water treatment plant and all associated infrastructure. Access to site was steep and inaccessible to large plant and machinery. 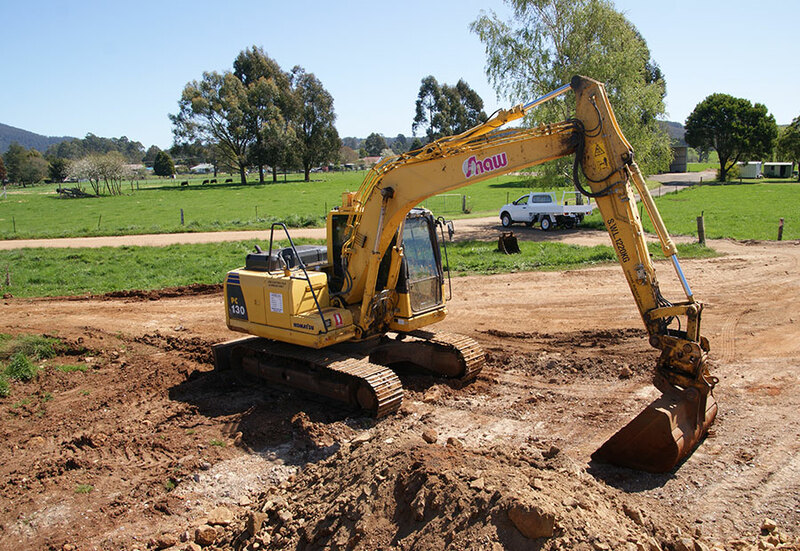 To keep the existing treatment plant operational whilst constructing the new pumping station. 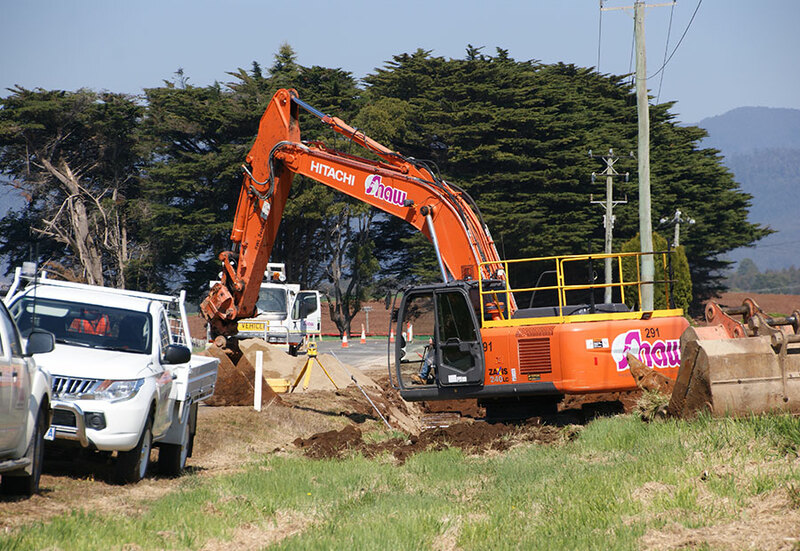 Large deep excavation was required in a very restricted area with existing services in close proximity. Due to rock being encountered, sheet pile shoring was not an option so trench shields/benching was used. 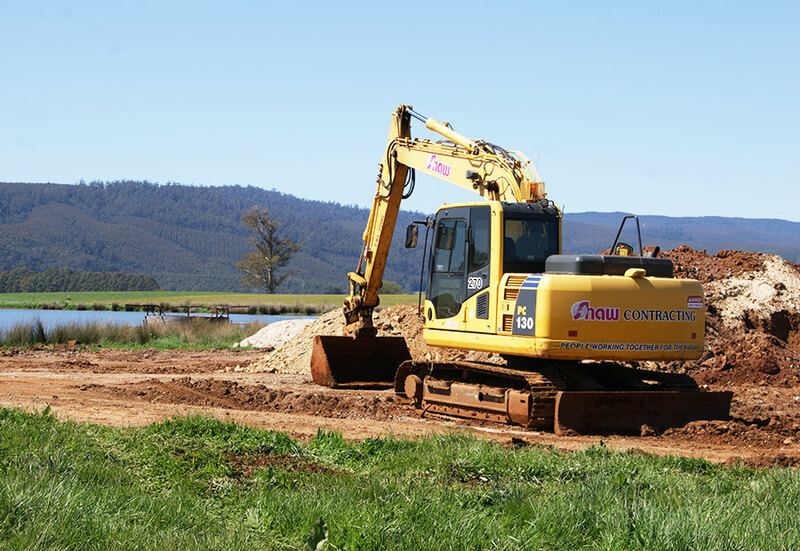 Due to delays on delivery of the overflow tanks, the site had to be maintained and existing excavations protected. 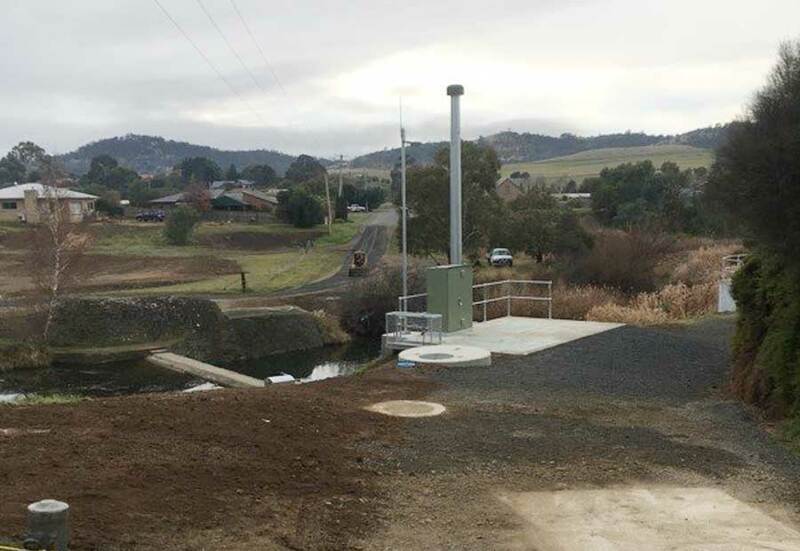 The commissioning of the new pump station was critical to allow for the completion of the remaining project, this was done on time and to the complete satisfaction of Taswater. 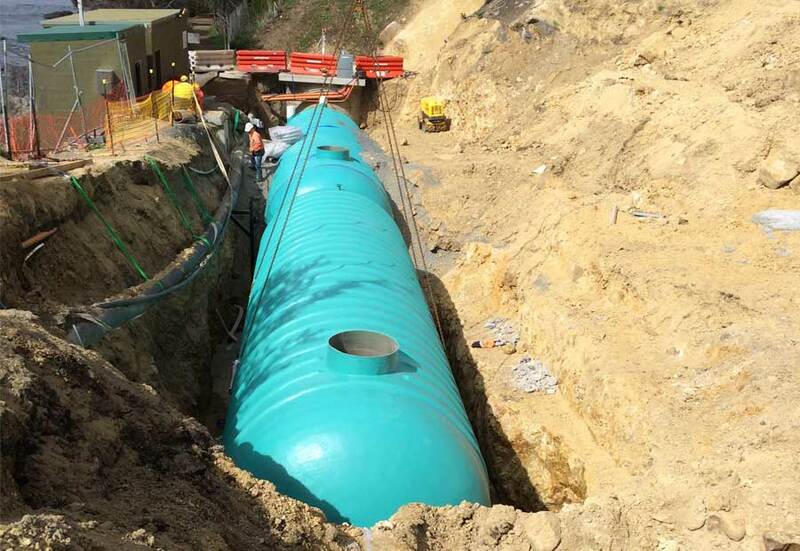 After delays on the delivery of the overflow tanks, the remainder of the works were completed with minimal disruption to the existing services and nearby residents/business owners. The Torrens Street SPS is one of three Sewer Pump Stations in Richmond. It is located next to the Coal River and services approximately 300 properties. Two of the key issues were the deficiency of emergency storage capacity and overflow mitigation. TasWater identified this SPS as high risk based on its condition and performance. Torrens St SPS had no dedicated overflow discharge point. Overflows occured through the lowest maintenance hole on the eastern side of the Coal River, which then spilt into the Coal River and then entered Pittwater Bay downstream. Due to high value aquaculture industries Pittwater Bay is considered high sensitivity receiving environment, which stipulates eight hours Average Dry Weather Flow (ADWF) emergency storage capacity. 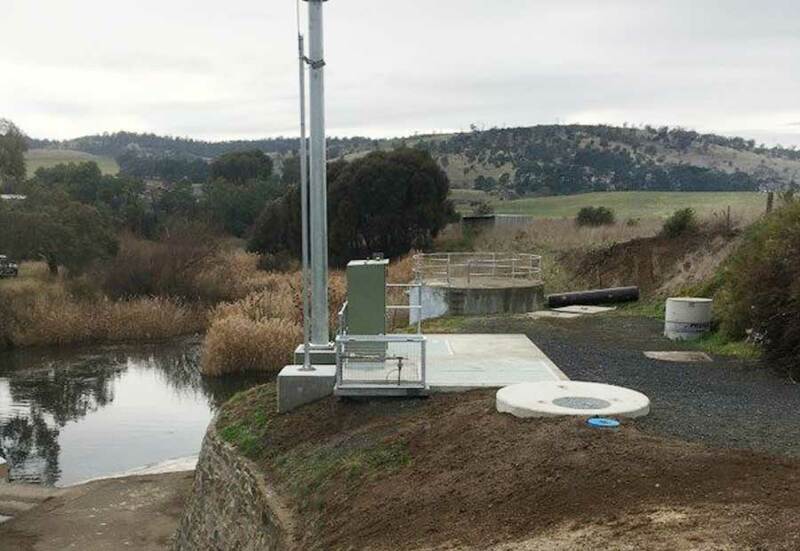 The existing pumps were undersized as they did not exceed Peak Wet Weather Flow (PWWF) according to TasWater’s design standards. to function as a wet well for the previous pump station. Modification works such as benching and upsizing of the inlet pipe to the existing SPS were required to achieve compliance and reduce current maintenance activities. The original switchboard did not comply with TasWater’s standards and required replacement. The original rising main between the SPS and the Sewage Treatment Plant (STP) was approximately 1.3km long with the first 280m being sized at 80mm and the remainder at 100mm. It required replacement with a larger diameter pipe. It crosses Page’s Creek, a small side arm of the Coal River, on Commercial Rd approximately 300 m before the STP. In the present configuration, a separate rising main originating from Bilney St SPS joins into Torrens St rising main at the STP. One of the major challenges on this project was the construction of a temporary pump station directly adjacent to the existing and within the coal river flood zone. This was achieved by bypassing the existing gravity mains into a poly holding tank and utilising the original pumps to deliver the sewage through the original rising main. 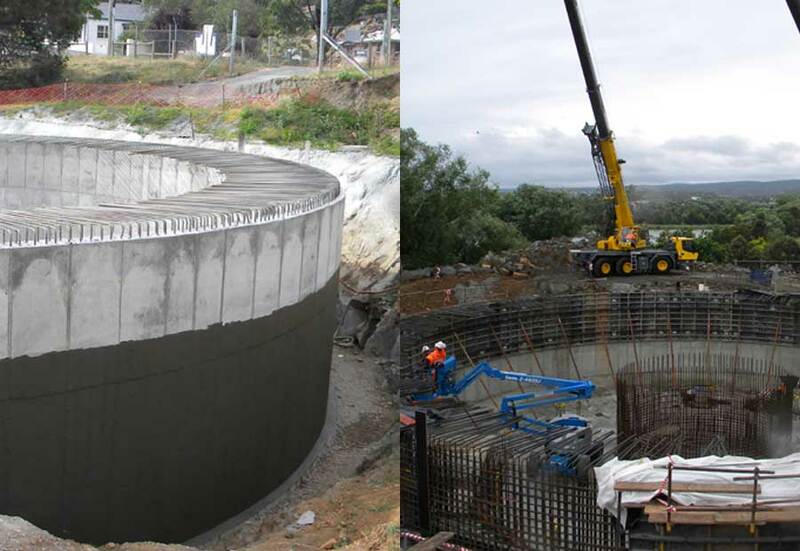 TasWater constructed two 20ML treated water tanks in Tolosa Street, Glenorchy to replace the Tolosa Dam which is to be decommissioned due to significant dam safety and water quality issues. a pump station including electrical works and new switchboards. 559 dia MSCL inlet and outlet pipe works including flow meter pit. Demolition of existing infrastructure inc asbestos lined pipework’s and various buildings. 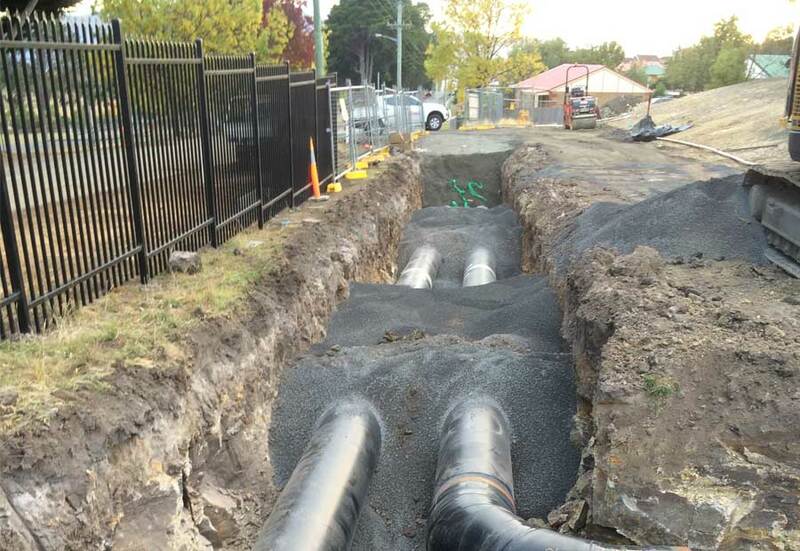 One of the major challenges on this project was the construction of the new inlet and outlet pipework’s through Tolosa st,this required excavating the west bound lane of tolosa street to 2.4 metres deep whilst still ensuring access to road users and adjacent residents. 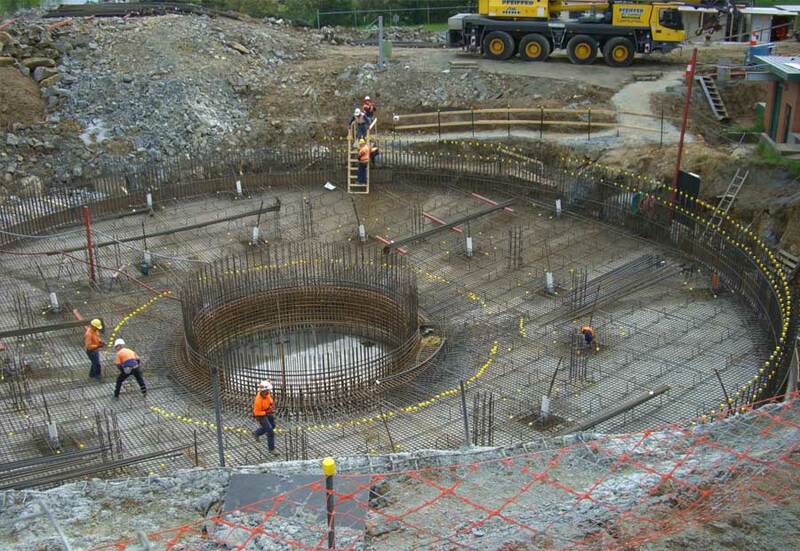 For various historical reasons Launceston currently have five wastewater treatment facilities. Four of these are located within the city and suburbs and existing treatment plants have been designed to meet the effluent standards that were introduced in 1974. Council considered it more economical to decommission some of the smaller treatment facilities and invest in upgrading one or two major treatment facilities. Some investment in pipelines and other infrastructure was also necessary to redirect sewage to the upgraded treatment facilities. The pump station on Queechy Road was built 45 years ago and overflows during heavy rain. During these overflows odours impact the surrounding residential area. 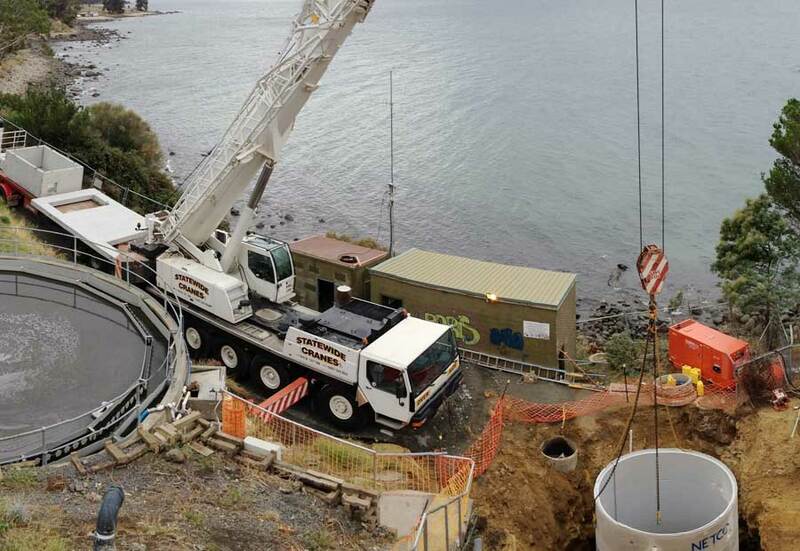 Shaw Contracting was contracted to carry out the $5 million upgrade to the Queechy Pump Station. Shaw Contracting developed a new pump structure, including a storage tank on the existing site. Inside the main storage tank, which will be used only for overflow, is a six-metre wet well which will handle the day-to-day operations. When that tank reaches capacity it will overflow into the larger outer tank. Situated in a heavy suburban residential area of Launceston, the pump station is designed to be as unobtrusive as possible. While currently quite visible to the road, the new facility has been designed to blend in with the surrounds and ultimately form a landscaped link to nearby parklands. One of the major challenges with the Queechy Road facility is the size of the site. 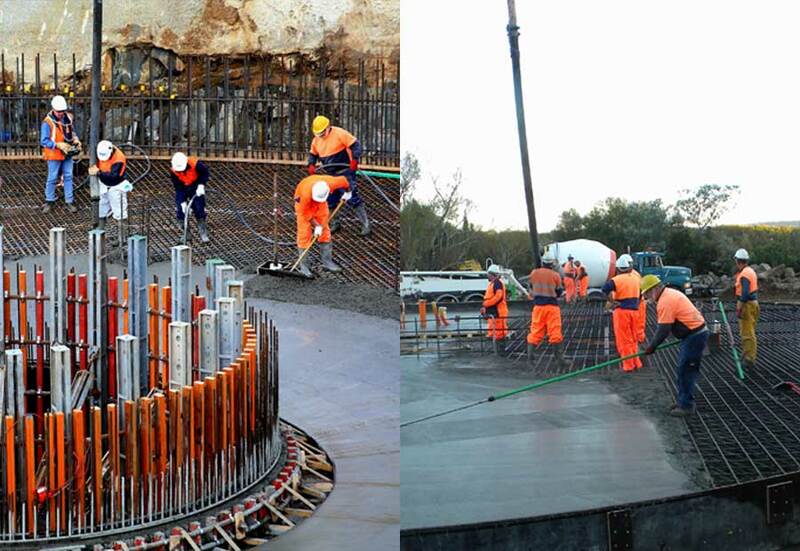 With the existing pump station still operational, excavation, concreting and heavy lifting equipment had to be managed strategically to ensure smooth construction. Shaw knew that the material excavated could be reused on the job, but there was a large amount of rock on the site. Not wanting to break up the existing rock and with a number of new sub divisions in the area Shaw was able to attract plenty of clean material from these sites. Shaw then put all excess rock in the nearby creek, which helps with erosion problems. Completed in late July 2010, the new system has ensured better odour management and enhanced environmental benefits. The area, which will be open to the public, has been landscaped and floodlit, and has become a feature of the surrounding area in stark contrast to the former structure. When decommissioned the replaced building will be demolished and used as landfill on the site. The ultimate test for the Queechy Road site is that nobody will know it is doing its job. "The ultimate test for Queechy Road pumping station is that nobody will know its doing its job."